Each month we hand-pick and mail a book tailored to your or your loved one’s reading preferences. Shirts, socks, pins, prints, and more. A Gift Certificate can be the perfect solution. Available in many denominations, $10 and up. "Shirk is a generous writer whose penchant for detail and poetic observation will surprise even the staunchest skeptic." 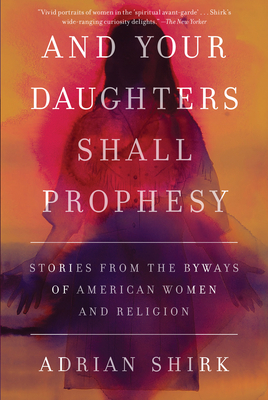 --Juan Vidal, NPR's "Best Books of 2017"
And Your Daughters Shall Prophesy is a powerful, personal exploration of American women and their theologies, weaving connections between Adrian Shirk's own varied spiritual experiences and the prophetesses, feminists, and spiritual icons who have shaped this country. Each woman presents a pathway for Shirk's own spiritual inquiries: the New Orleans high priestess Marie Laveau, the pop New Age pioneer Linda Goodman, the prophetic vision of intersectionality as preached by Sojourner Truth, "saint" Flannery O'Connor, and so many more. Through her journey, Shirk comes to believe that, as the culture wars flatten religious discourse and shred institutional trust, we should look to the spiritual visions and innovations of women, who, having spent so much time at the margins of religious discourse, illuminate its darkened corners. ADRIAN SHIRK was raised in Portland, Oregon, and has since lived in New York and Wyoming. She's a columnist at Catapult, and her essays have appeared in The Atlantic and other publications. She has produced radio stories for Wyoming Public Media and Pop Up Archive, and she holds an MFA in nonfiction from the University of Wyoming in Laramie. Currently, she teaches women's studies and creative writing at Pratt Institute. She lives on the border of the Bronx and Yonkers with her husband, Christopher Sweeney, and Quentin the cat.